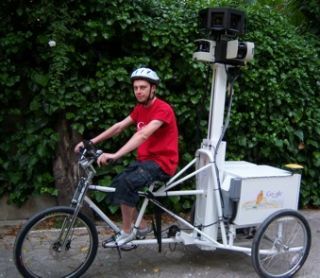 Google is reportedly planning on bringing virtual world advertising to Google Street View. In what seems like something straight out of cyberpunk sci-fi, the search giant has recently been touting the offering around European advertising agencies. Critics are already likening the plan to something out of dystopic future visions of movies such as Bladerunner, Minority Report and Brazil. Cnet was first to break the report, with the Register also noting that Google first filed for a patent "on a system that automatically recognizes word and characters that turn up in digital photos" back in 2007. Luc Vincent, one of the leaders of the Street View project, was also behind that patent in 2007. "In one implementation, advertisements are presented along with the presented image," the application read. "For example, an advertisement can be presented for the business identified in the image. Alternatively, one or more advertisements can be presented for alternative businesses. Additionally, the advertisement can be for one or more products associated with the business in the presented image, user search terms, or according to other criteria." Cnet notes that Google's European presentation suggests Street View ads that link back to merchant info in its Local Business Center database and connecting to its Favorite Places program, offering promotions and discounts to those viewing the adds via Street View.